The last place Lea and I stopped in Kurashiki before heading back up to Osaka was a pottery shop that specialized in Bizen-ware pottery, which is characterized by its dark-brown glazing (perhaps Crayola would have called it ‘burnt sienna’) and earthy finish. 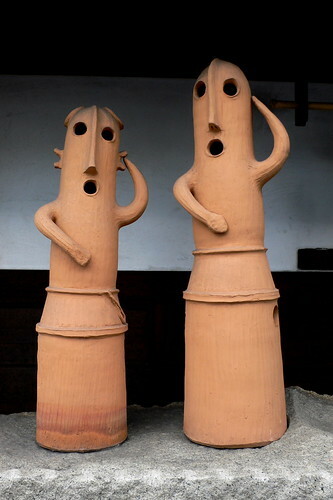 In addition to Bizen-yaki, there were was also a large selection of full-sized haniwa figurines on offer. When I asked about the haniwa I was told that the reason the shop was selling them was because the Okayama area was the southernmost point where haniwa figures had been unearthed. Or at least that’s what I think I was told.